Eight-year-old Maria Elena del Valle went on a red string strike. She was angry about having to do all the household chores while her older brother got away with leaving their home a mess every day. She proposed to divide in two every space she shared with him, including the toilet seat, with a red string down the middle for two weeks – half for her and half for her brother. She wanted to show her mother physical evidence that her brother was the one dirtying their home. Did Maria know that she would eventually become a passionate activist promoting decent work and pay for women workers in the informal economy of the Bronx, New York? 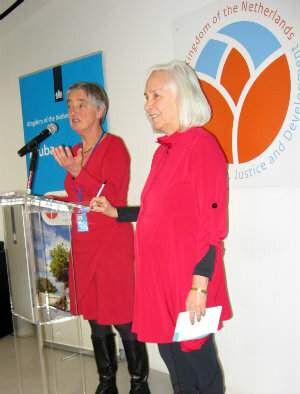 Nine women’s rights activists enthralled the audience packing the Netherlands Permanent Mission to the UN on the 59th session of the Commission on the Status of Women. They performed passionate stories about personal and professional struggles with discrimination, violence and the power dynamics at play. The activists, eight women and one man from Ecuador, India, Jordan, Nicaragua, Nigeria, Paraguay, South Africa and the US, are part of an exciting new initiative launched at the CSW March 2015 by Gender at Work and TMI Project, with support from Hivos, that brings untold stories into public spaces. The collaborative storytelling laboratory is a way of catalysing analysis, learning and greater collective action. The intense pressure cooker methodology of TMI Project helps participants in only a few days to write, tell and perform compelling stories of personal, real life journeys. Momal Mushtaq from Pakistan narrated her flashbacks while walking through metres of snow from downtown Manhattan to UN headquarters. She told about the origins of the dream that she has been able to realise now, at the age of 25, the Freedomtraveller initiative, fighting barriers to women’s mobility. As a girl she was only allowed to ride a bicycle indoors while her brothers ventured into the streets of Karachi. During her studies abroad, she used the bicycle as a means of transport, and just for fun, cycled from Germany to the Netherlands and Belgium. That inspired her to set up the #Iamfree campaign. Douglas Mendoza Urrutia from Puntos de Encuentro in Nicaragua narrated how he grew up amidst violence, with a father who committed suicide when Douglas was still a young boy. Fatherhood was not his destiny until he was drawn into the work of Puntos de Encuentro as a young adult. He now coordinates the masculinity programme and is a proud and caring father of two boys.